Released on April 16, 2001 by Decca Music Group Ltd.
George Frideric Handel, Composer - Anonymous, Author - John Eliot Gardiner, Conductor, MainArtist - English Baroque Soloists, Orchestra, MainArtist - Wilhelm Hellweg, Producer, Recording Producer Copyright : ℗ 1985 Universal International Music B.V.
2 3. "And the glory of the Lord"
George Frideric Handel, Composer - Symphonieorchester des Bayerischen Rundfunks, Orchestra, MainArtist - Chor des Bayerischen Rundfunks, Choir, MainArtist - Sir Colin Davis, Conductor, MainArtist - Charles Jennens, Author Copyright : ℗ 1985 Universal International Music B.V.
George Frideric Handel, Composer - Kurt Masur, Conductor, MainArtist - Gewandhausorchester Leipzig, Orchestra, MainArtist - Nicola Francesco Haym, Author - Elly Ameling, Soprano, MainArtist, AssociatedPerformer Copyright : ℗ 1986 Universal International Music B.V.
Vjekoslav Sutej, Conductor, MainArtist - English Chamber Orchestra, Orchestra, MainArtist - George Frideric Handel, Composer - Jose Carreras, Tenor, MainArtist, AssociatedPerformer - Anna Barry, Producer - Nicolò Minato, Author, Original Text Author - Erik Smith, Producer - Silvio Stampiglia, Author, Original Text Author - Federico Agostinelli, Arranger, Work Arranger Copyright : ℗ 1993 Universal International Music B.V.
George Frideric Handel, Composer - John Eliot Gardiner, Conductor, Arranger, Work Arranger, MainArtist - English Baroque Soloists, Orchestra, MainArtist - Wilhelm Hellweg, Producer, Recording Producer - Onno Scholtze, Balance Engineer, StudioPersonnel - Charles Jennens, Author - The Monteverdi Choir, Choir, MainArtist - Anthony Hicks, Arranger, Work Arranger - Stan Taal, Recording Engineer, StudioPersonnel - Erwin de Ceuster, Recording Engineer, StudioPersonnel Copyright : ℗ 1991 Universal International Music B.V.
George Frideric Handel, Composer - Sir Neville Marriner, Conductor, MainArtist - Academy of St. Martin in the Fields, Orchestra, MainArtist Copyright : ℗ 1980 Universal International Music B.V. 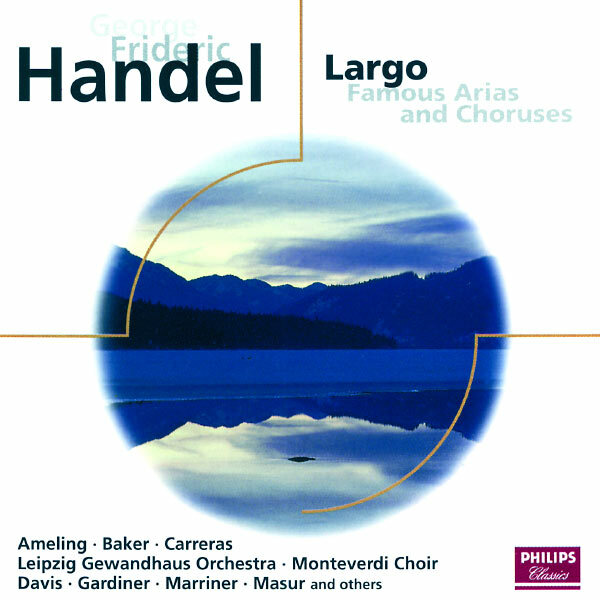 Traditional, Author, Original Text Author - George Frideric Handel, Composer - John Eliot Gardiner, Conductor, MainArtist - English Baroque Soloists, Orchestra, MainArtist - Wilhelm Hellweg, Producer, Recording Producer - Onno Scholtze, Balance Engineer, StudioPersonnel - Charles Jennens, Adapter - The Monteverdi Choir, Choir, MainArtist - Stan Taal, Recording Engineer, StudioPersonnel Copyright : ℗ 1995 Universal International Music B.V.
Dame Janet Baker, Mezzo-Soprano, MainArtist, AssociatedPerformer - English Chamber Orchestra, Orchestra, MainArtist - George Frideric Handel, Composer - Raymond Leppard, Conductor, MainArtist - Wilhelm Hellweg, Producer, Recording Producer - Belisario Valeriani, Author, Original Text Author Copyright : ℗ 1973 Universal International Music B.V.
George Frideric Handel, Composer - Sir Neville Marriner, Conductor, MainArtist - Anonymous, Author - Academy of St. Martin in the Fields, Orchestra, MainArtist - Academy of St. Martin in the Fields Chorus, Choir, MainArtist Copyright : ℗ 1985 Universal International Music B.V.
George Frideric Handel, Composer - Sir Neville Marriner, Conductor, MainArtist - Wilhelm Hellweg, Producer/Balance Engineer, StudioPersonnel - Academy of St. Martin in the Fields, Orchestra, MainArtist Copyright : ℗ 1982 Universal International Music B.V.
Vjekoslav Sutej, Conductor, MainArtist - English Chamber Orchestra, Orchestra, MainArtist - George Frideric Handel, Composer - Jose Carreras, Tenor, MainArtist, AssociatedPerformer - Anna Barry, Producer - Giacomo Rossi, Author - Torquato Tasso, Author, Original Text Author - Erik Smith, Producer - Aaron Hill, Author, Original Text Author - Federico Agostinelli, Arranger, Work Arranger Copyright : ℗ 1993 Universal International Music B.V.
12 33. Chorus: "Let all the angels of God"
George Frideric Handel, Composer - Symphonieorchester des Bayerischen Rundfunks, Orchestra, MainArtist - Chor des Bayerischen Rundfunks, Choir, MainArtist - Sir Colin Davis, Conductor, MainArtist - Charles Jennens, Author - Stuart Burrows, Tenor, MainArtist, AssociatedPerformer Copyright : ℗ 1985 Universal International Music B.V.
George Frideric Handel, Composer - Sir Neville Marriner, Conductor, MainArtist - Academy of St. Martin in the Fields, Orchestra, MainArtist - Vittorio Negri, Producer/Balance Engineer, StudioPersonnel Copyright : ℗ 1980 Universal International Music B.V.
15 "E pur così in un giorno" - "Piangerò la sorte mia"
English Chamber Orchestra, Orchestra, MainArtist - George Frideric Handel, Composer - Raymond Leppard, Conductor, MainArtist - Nicola Francesco Haym, Author - Elly Ameling, Soprano, MainArtist, AssociatedPerformer - Vittorio Negri, Producer, Recording Producer Copyright : ℗ 1970 Universal International Music B.V.
16 " Praise the Lord "
George Frideric Handel, Composer - Anonymous, Author - John Eliot Gardiner, Conductor, MainArtist - English Baroque Soloists, Orchestra, MainArtist - Wilhelm Hellweg, Producer, Recording Producer - The Monteverdi Choir, Choir, MainArtist Copyright : ℗ 1985 Universal International Music B.V.
Dame Janet Baker, Mezzo-Soprano, MainArtist, AssociatedPerformer - English Chamber Orchestra, Orchestra, MainArtist - George Frideric Handel, Composer - Bible, Author - Raymond Leppard, Conductor, MainArtist - Wilhelm Hellweg, Producer, Recording Producer Copyright : ℗ 1973 Universal International Music B.V.
George Frideric Handel, Composer - Sir Neville Marriner, Conductor, MainArtist - Anthony Rolfe Johnson, Tenor, MainArtist, AssociatedPerformer - Academy of St. Martin in the Fields, Orchestra, MainArtist - Catherine Denly, Mezzo-Soprano, MainArtist, AssociatedPerformer - Thomas Morell, Author - Academy of St. Martin in the Fields Chorus, Choir, MainArtist Copyright : ℗ 1985 Universal International Music B.V. This Compilation ℗ 2001 Universal International Music B.V.